Crystals can be used to help your meditation practice reach higher spiritual levels. When using crystals, it is important that you make it your own by connecting with the crystal. There are many different crystals to choose from, you should always take your time in selecting a crystal to work with as your crystal can supply the spiritual energy needed to help you during your healing process and personal development. When choosing a crystal, find the one that seems to leap out at you. Pick it up and hold it in the palm of your hand. Relax your mind and body in order to open yourself up to any sensations. If the particular crystal is meant to belong to you, you should feel either a tingling sensation emitting from the stone or even a strong pulsation vibration in the palm of your hand. If you have a hard time with feeling the crystal, some crystals which are likely to be the most helpful in meditation and increasing your spiritual awareness are quartz crystals, amethysts or rose quartz. These crystals were used in ancient times by men of mystic faith and have long been held to contain their own special properties. 1) Lie on a bed or sit in a comfortable chair in a quiet place where you will not be disturbed. Relax your body starting from your feet and working upward towards your head. 2) Focus your attention on the crystal you have chosen in the palm of your hand. Concentrate on the stone, its shape, its color, its texture. Close your eyes and see the stone clearly in your mind. 3) Visualize the colored rays from the stone wash over you starting from the top pf your head and slowly down to your feet. As you concentrate you should feel a warm glow surround you. 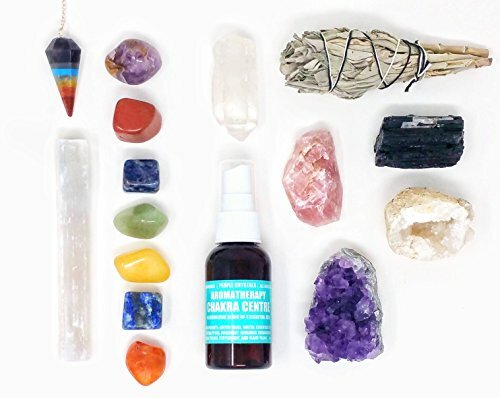 16 pcs Chakra Crystal Healing Kit! / Lot of Chakra tumbles, Amethyst Cluster, Raw stones, Sage, Meditation Spray + more. Bohemian Gift Set! How to Choose Your Crystals?